"Do not leave us alone. 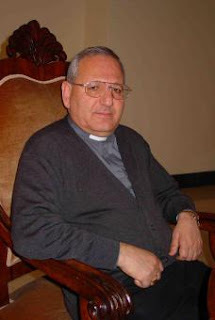 Do not leave us isolated and abandoned": this is the appeal to all Christians of the world issued by Louis Sako, the Chaldean archbishop of Kirkuk, who this morning received the prize "Defensor Fidei" from the foundation "Fides et Ratio" and from the magazine "Il Timone". The prize is accompanied by an award of 10,000 euros. In his impassioned speech, the archbishop recalled "the terminal exodus" of the Iraqi Christians, who are fleeing the country under the pressure of lack of security, misery, and "ethnic-religious cleansing" carried out by fundamentalist groups. Recalling the sacrifice of Archbishop Paulos Faraj Rahho, who died after being kidnapped last February, and of many Iraqi priests and faithful, Archbishop Sako asked western Christians to "take stock of the seriousness of this . . . tragedy, and apply diplomatic and political pressure to the United States, the Iraqi government, and also to the countries that support the Islamisation of Iraq, in order to guarantee the respect of personal dignity and fundamental freedoms, and to stop the persecution and ethnic cleansing". Meanwhile, last week the Pope received the bishops of Myanmar on their long-scheduled ad limina visit, during which he addressed the fallout of the recent Cyclone Nargis. In his address to the prelates, B16 said that "during these difficult days, I know how grateful the Burmese people are for the church’s efforts to provide shelter, food, water, and medicine to those still in distress," adding his hope "that, following the agreement recently reached on the provision of aid by the international community, all who are ready to help will be able to furnish the type of assistance required and enjoy effective access to the places where it is needed most." Making a visit to the Rome headquarters of Caritas Internationalis -- the global umbrella group of Catholic relief agencies -- Archbishop Paul Zingtung Grawng of Mandalay told its leaders that, thanks to the aid coming in, "the people of Myanmar for one of the first times feel a sense of being connected to the outside world and that we are not alone. For all the help, we’re grateful. Citing the continued needs of the over 60,000 Nargis survivors being aided by Caritas, Grawng -- head of the nation's bishops conference -- said that "many of these people would now be dead if it had not been for the work of the Church and the solidarity of Caritas and its supporters who have given so generously." Almost immediately, the archbishop noted that "church workers went immediately into the worst hit villages to rescue people and bring them to safety. We are able to provide food, shelter and medicine to people in camps in churches. We are also able to deliver supplies to people who have remained in their villages." The coordinator for the work of Catholic relief agencies in 162 countries, Caritas has appealed for $8.2 million to aid the ongoing efforts in Myanmar.